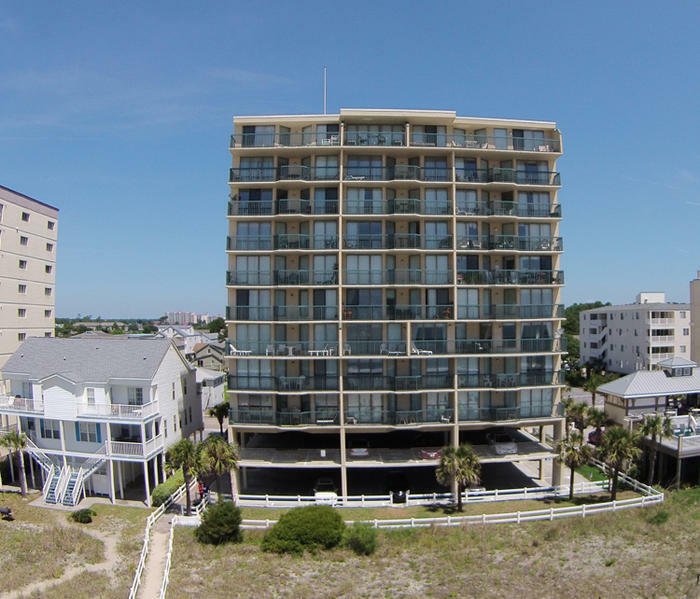 Some of these North Myrtle Beach vacation rentals have high-speed Internet access. And for your convenience there is a washing machine and clothes dryer provided for you in each of these North Myrtle Beach condominiums, too. These North Myrtle Beach rentals are non-smoking units that are full of amenities and comfort to help make your North Myrtle Beach vacation one to remember. Make yourself at home in this North Myrtle Beach resort where a swimming pool sparkles in the sunlight and the sound of the Atlantic Ocean is in your backyard. You can easily see the Atlantic Ocean and white sandy beaches from the oceanfront balcony of your Emerald Cove II rental. And the swimming pool is on the opposite side of this North Myrtle Beach resort and ready for you to jump right in. Emerald Cove II offers such grand views of the Atlantic Ocean from the privacy and comfort of your North Myrtle Beach rental. Enjoy an oceanfront sunrise while relaxing on the balcony. Watch runners and walkers take to the shoreline to start their day with some exercise. Look for dolphins swimming by just offshore. Or just put on your bathing suit and run downstairs to feel the fantastic ocean water for yourself. Comb the beaches for beautiful seashells and build amazing sand castles during your stay at Emerald Cove II. Count the boats you see on the water and look in the air for people who are parasailing. There is plenty to do during your North Myrtle Beach vacation at Emerald Cove II. In close proximity to this North Myrtle Beach resort there are restaurants, shopping opportunities, live entertainment theatres and water sports. You might take the family and explore the Cherry Grove Fishing Pier. It is a fun experience even if you don’t cast a line in the water, though pier fishing is a great time, too. If you want to bounce across the waves then go on a banana boat ride. Sea Doo rentals, boat rentals and fishing charters are also available in North Myrtle Beach, South Carolina for water enthusiasts. There are numerous live entertainment theatres in the Myrtle Beach area. With family-friendly productions that are filled with singing and dancing, all ages will have a good time at the Carolina Opry and Alabama Theatre. Pirates Voyage and Medieval Times are dinner theatres where you will be served a wonderful meal as you watch a story unfold in the arena before you. There is also Legends in Concert, the Ghost Theatre, Palace Theatre and House of Blues nearby Emerald Cove II. For some fantastic shopping visit The Market Common, Barefoot Landing and Broadway at the Beach. These North Myrtle Beach area hot spots boast shops, restaurants and entertainment in one grand location. Each one of these shopping destinations is built near a freshwater lake so the setting is divine. There are more than 1,500 restaurants in the Myrtle Beach area so dining out during your North Myrtle Beach vacation can be a real treat. If you want all-you-can-eat crab legs alongside a variety of shrimp, fish, oysters and clams you might choose a seafood buffet for one of your North Myrtle Beach vacation dinners. If sushi and hibachi-grilled steak sounds like a winner, then make reservations for a Japanese steakhouse. Burgers on the beach, cocktails on the waterfront and casual cafes that welcome flip flops are all part of the restaurant scene around the beautiful Emerald Cove II in North Myrtle Beach, South Carolina. Elliott Beach Rentals is not affiliated with onsite management or the HOA of Emerald Cove Ii.